As part of the 2016 Summit Sweepstakes: Road to Freedom, Mansfield Plumbing gave away five Milwaukee® 9-Tool Combo Kits and 25 Outback Steakhouse® $100 gift cards. Thirty-one prizes were given out to winners nationwide. The more Summit toilets purchased during the sweepstakes timeframe, the more chances licensed plumbers and contractors had to win a prize. Wholesalers were also encouraged to participate in a 2016 Scratch N’ Win promotion that ran in conjunction with the 2016 Summit Sweepstakes. 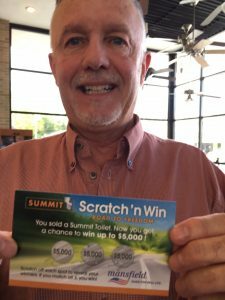 Every time a wholesaler sold a Summit toilet during the promotion and entered their customer for a chance to win in the sweepstakes, they received a Scratch N’ Win card. More than 1,700 Scratch N’ Win cash prizes were awarded during the promotion with John Landolt, showroom manager at Wholesale Supply in Cleveland, Tennessee winning the mega $5,000 cash prize.